Summary: The nicely done feeling of impending doom is occasionally undermined by some unintentionally funny moments, but for the most part 21 is enjoyable enough. Once again playing to type, one-trick pony Spacey proves that when it comes to being creepy and weird, he’s the master. Ben Campbell (Sturgess) is a super-bright, socially backward undergraduate at M.I.T., with his sights set on Harvard Medical School. But Ben’s widowed mother cannot afford the tuition, and Ben is up against hundreds of equally bright students for the few scholarships that are available. 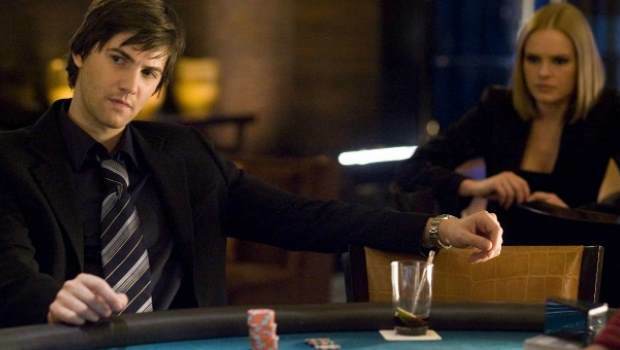 And then Ben comes to the attention of his maths professor, Micky Rosa (Spacey), who with a team of students has worked out a way to beat the casinos at blackjack. Rosa, with the help of Jill Taylor (Bosworth), persuades an initially reluctant Ben to join. At first Ben is nervous, but soon he’s seduced by the glamour, the money, the women, and the high stakes lifestyle. He enjoys a kind of double life: during the week, cycling round a permanently damp and autumnal Cambridge in hoodie and chinos; at weekends, slipping into an Armani suit and a false identity, driven in limos and staying in luxury hotels. And soon the money stops being important to Ben – he has more than enough for his Harvard tuition. Beating the casinos is addictive. Micky has warned Ben that they do not gamble; break his rules and you’re out. The system includes warnings about cooling tables and the casinos enforcers and Ben’s over-reaching himself brings him to the attention of the meanest one of all, Cole Williams (Fishburne); at the same time Micky starts to perceive Ben as a threat to his leadership, and the team begins to fall apart. 21 is enjoyable in a predicable sort of way. A bit like gambling really; Ben wins, Ben loses, Ben realises that he has been a fool and grows up a bit. Ben himself, British actor Jim Sturgess, is appealing in a nerdy kind of way, all excited about some incredibly dull science prize, hanging out with his two equally geeky best friends, and selling preppy menswear for the minimum wage – and then suddenly he’s waltzing into the MGM Grand, greeted by name by the doorman, dressed in suits worth thousands of dollars; he even starts to carry himself differently. But everything has its price; Ben lets his friends and himself down and has to learn some lessons, and it’s here that the film gets a bit cheesy. It’s pleasing to see Spacey once again playing a creepily unpleasant character. With his doughy face, Spacey is never believable as a hero anyway and it’s good to see that he seems to understand that. Rosa is extremely intelligent and has long figured out how to beat the casinos, he just can’t do it himself as he is too well known. It is never explained why he’s doing this; presumably a mixture of money and ego, but it doesn’t seem to be part of his role as educator. Bosworth is less irritating than usual though she still looks like she could do with a good meal. Luckily you don’t have to know much about blackjack to follow play; unlike the interminable poker scenes in Casino Royale, 21, as it is also known, is pretty simple. That’s not to say that it’s particularly interesting to watch, so the film ratchets up the tension by quickly having Ben come to the attention of the security staff, and from then on Ben is playing on borrowed time, emphasised by the oft-discussed new biometric facial recognition software that the casinos are about to introduce. The nicely done feeling of impending doom is occasionally undermined by some unintentionally funny moments, but for the most part 21 is enjoyable enough.